Getting the most out of Flip video camerasThe picture above (a still from a Flip video) is of my venerable old three chip Sony VX1000 video camera, Frezzi light and associated 10 pound battery belt. In the foreground is a Flip video camera. 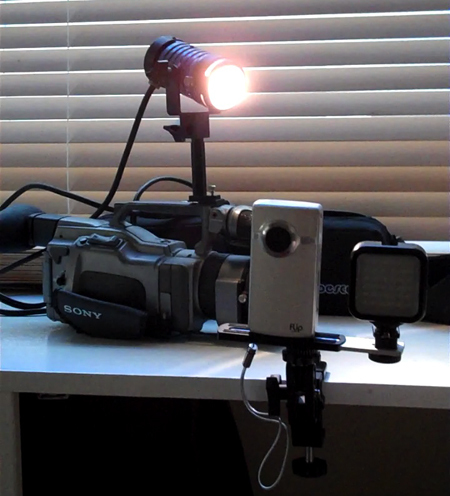 The picture above (a still from a Flip video) is of my venerable old three chip Sony VX1000 video camera, Frezzi light and associated 10 pound battery belt. In the foreground is a Flip video camera. If you aren't aware of Flip cameras yet they are essentially high quality hi def video cameras that are small in size but produce very high quality video footage. I've lugged that Sony VX1000 camcorder all over the planet in its flight case along with a full size tripod: more recently I've almost always got my two Flip Ultra HD video cameras in my lap top bag. Admittedly the VX1000 is no longer state of the art compared to current cameras in its class, but the Ultra HD certainly is. What's so amazing about Flip video cameras is the amazing quality you can get out of them with appropriate lighting and some control over your location audio. They are very forgiving straight out of your bag but a little attention to detail works wonders as I'll discuss below. Flip cameras are an incredibly useful addition to any collaboration toolkit in both private and professional life. These pocket sized wonders are useful in obvious ways - capturing family and friends events and site seeing - but they have much broader utility. The superb high definition picture quality makes using a Flip more useful than a stills camera since single image capture is easily possible from your footage. Packing a Flip when assessing a physical object, whether a car you're thinking of buying or recording an issue with a machine for your work colleagues elsewhere on the planet, makes it possible to really look carefully at it afterwards, to see and hear things you might not have noticed. Archiving this footage in wikis, blogs and content management and other systems is trivial but more importantly greatly extends the use of those online tools in a collaborative context. You can see Flip video everywhere from classic car restoration forums to horse and livestock wikis to oil and gas pipeline maintenance sites ...and countless other areas. Trivial to set up and simple to get going, the one issue with Flip is motion sickness inducing hand held movement. The fundamentals of all filming are lighting, tripod and audio quality, and using a Flip is no different. Flip make a useful inexpensive bendy leg tripod that should be a must have in your bag for rapid setup. The other extremely useful item to have is a clamp so you can attach your Flip to an object at the appropriate height and distance away from your subject. There are various options for this - I use the 'Ultra Clamp' seen in the picture above which enables you to attach your Flip to anything from bicycle handlebars or your vehicle to a nearby shelf or pipe, and which has the added benefit of a shoe to attach a light. While Flips are excellent in relatively low light conditions you often need help in that area. Packing inexpensive reflectors helps make use of available light - this article outlines how to use these to best effect. A reflector kit packs away into a small pouch - it's a great idea to put some sticky tape in with them to hold in place. The light I use with the ultra clamp shown above is the 'Sima Ultra Bright video light', an inexpensive rechargable light source you can mount next to the Flip or bounce off a wall or reflector to illuminate your subject. I bought all these accessories from my local video store (Adolph Gasser in San Francisco) and recommend talking advantage of your local experts who can recommend appropriate kit for your needs. If you're wriggling around under an old car or other dark place holding the ultra clamp mounted Flip and light (there's also a night vision Sima light I haven't tried yet) is invaluable for trouble shooting in a more civilized setting with a beverage of your choice. The Flip's weak link is audio: because the microphone is built into the case you are at the mercy of its range and other noise. This is fine in many informal situations but if you're interviewing someone for example you are very limited by this range. I'd love to see a 'microphone in' socket on a future Flip so you could run an inexpensive lapel mic or similar to your subject. A Bluetooth wireless microphone option would be amazingly useful and open up all sorts of possibilities. One of my formal uses for Flip cameras is to record important meetings - with the permission of participants - and I make my associated written notes annotated by time. I'll type '17:30, scope and existing technology' for example, for a period starting seventeen and a half minutes in the meeting on that topic. I'll archive the meeting notes and video for all participants so they can revisit any areas of the meeting that may need clarification or revisiting later on. Recorded body language can say more than words, and play back can reveal visual cues you missed in the moment. For important decision making meetings this reference material can be much more useful than minutes and audio since it's a complete reference of the entire conversation if needed. I take at least one Flip camera with me just about everywhere I go these days with the above accessories, it's one of the most useful things I've ever owned and the more I use them the more uses I seem to find. Multiple Flip cameras plus video editing software makes multi camera shoots a reality - just borrow all your friends Flips and you're a Hollywood studio! Do you have any other tips and wrinkles for getting the most out of your Flip camera?